A few partial proof printings of the first run of Irish Free State Legal Tender Notes. There are few examples of proofs of early Irish Government notes to be found in collecting circles. De La Rue printer's specimens are relatively common, but actual production proofs like those shown below are quite scarce. 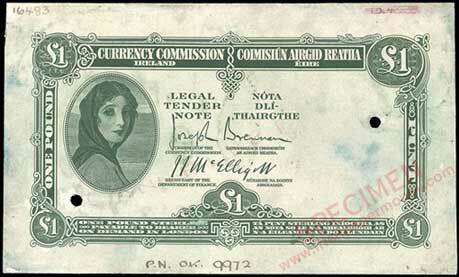 Irish Free State Lady Lavery One Pound proof. 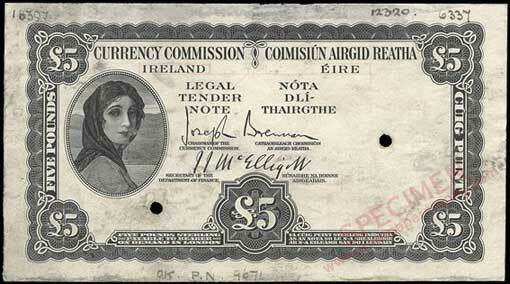 Currency Commission Irish Free State Five Pound proof ca1928. 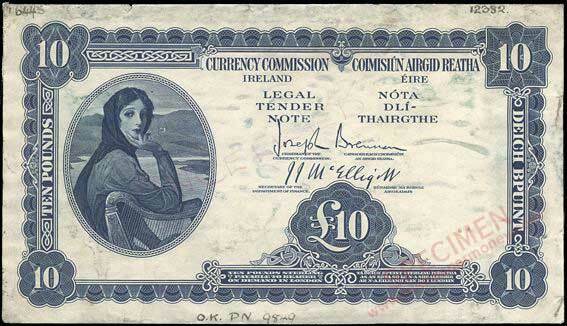 Currency Commission Irish Free State £10 note proof ca1928. There are other Lavery proofs around too. I saw some in auctions sometime back, mostly tests of the portrait. Are any known with different colour combinations, like they did with the Ploughman notes? Yes, partial printings of some denominations have been seen in different colours. I have seen a 10 Shilling note test in green.